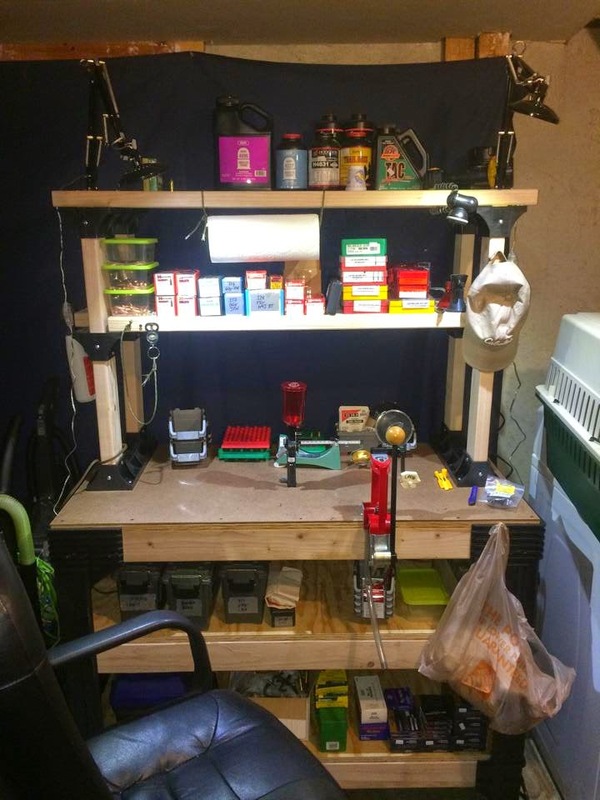 Back when I started reloading, my "bench" was a 20" square butcher-block table. I had enough room for the press, powder measure, a reloading tray, and a scale if I was doing precision loads. All my powder was kept in a nearby cupboard, along with primers and bullets. Dies and brass and other small bits were kept in a small filing cabinet. It worked, mostly. When we bought the house, I had long-term plans to build a larger bench (right after closing and insulating the third bay of the garage to become a workshop, and refinishing the deck, and replacing the garden shed, and...), but that never happened. With the move last year, that turned out to be a good thing. Now that we're mostly settled for the time being, and with the new .308 in the stable begging for precision loads, I decided it was time to start reloading again. I ordered a 2x4basics workbench kit from Amazon ($70 to my front steps) and picked up a dozen eight-foot 2x4s, a sheet of 3/4 B-C plywood cut 24/24/24/12/12(x48)*, and a 24x48 piece of 1/8" hardboard (Masonite). Then I screwed all the boards into the brackets following the handy pictorial "directions" included with the kit, and ended up with a nice 2'x4' bench. A handful of 1" drywall screws anchored the hardboard on top, and I built the shelving up on top of that, with the heights adjusted so I could get kegs of powder on top, and have plenty of room to work underneath. Initially the bench felt wobbly - not weak, just that it was teeter-tottering on the legs. That changed in a big hurry when I started loading it up with equipment and components. It's now rock-solid and not going anywhere. I picked up a couple architect-style LED desk lamps from Walmart and discarded the base in favor of drilling a 1/2" hole in the top shelf I'd built. A power strip on the side of the bench feeds those and an RCBS electronic scale, plus the tumbler as needed. A few 2" lag screws hold the press down, and tonight I'm going to grab a small bench vise from Home Depot to mount on the other end. * - If I was cutting this again, I'd make it a 30" deep bench instead of 24". It doesn't take up a tremendous amount more space and would provide a LOT more space for storing things. MrsZ had some bodywork done today, patching up a dinged wing that's been an issue for a while. She's home and resting as comfortably as can be expected. While GfZ and I were in the waiting room killing time before being called back to retrieve MrsZ, there was an elderly gent sitting with his young grandson on the far side of the room. He was any of a hundred older men you might see holding court at the local barber, or diner, or on the bench on the town square... right down to the "NAVY" ballcap. I didn't get a close look at it until he shuffled by us... underneath "NAVY", in smaller print, was embroidered the legend, "WWII - VB-20". On October 15, 1943, the squadron was redesignated Bombing Squadron TWENTY (VB-20), and on November 15, 1943 the squadron started to receive its first SB2C-1C Helldivers. On November 15, 1946, VB-20 was redesignated Attack Squadron NINE A (VA-9A). If those links above don't ring a bell for you... well, go back to History class. That stooped and shuffling old man has seen the elephant. I wish I'd had made a moment to shake his hand. I may fine-tune a load for the Savage. I expect I'll spend more time reloading each round for that than I have on any other cartridge I've done, because the rifle can use that level of detail. I may well sort bullets and cartridges by weight. I don't foresee myself doing things like turning cartridge necks. I wandered off when the guys at my club's F-class match started discussing the pros and cons of trickling an entire powder charge vs dipping and trickling to final. That said, there's an article I have read repeatedly over the years that is unlike anything I've found in the gun rags in the last decade. It was printed in 1993 by Precision Shooting, in a "special issue". The article was titled, "Secrets of the Houston Warehouse". It has been reprinted (reportedly with permission) in various places. It literally was a benchrest shooter’s dream come true, the Camelot of shooting ranges. Here, the breezes never blew, the mirage never shimmered, the sun never set and the rain never fell. Even the harshness of the weather, either heat or cold, was moderated by the insulating properties of the walls and steel roof. And so began perhaps the most insightful, revealing experimentation into practical rifle accuracy ever conducted. Over a period of six years, the levels of accuracy achieved in the Houston Warehouse went beyond what many precision shooters thought possible for lightweight rifles shot from sandbags and aimed shot-to-shot by human eye. “Day after day, week after week”, Virgil recalled “it would NOT shoot a group in the warehouse bigger than .070". There is a text-only version here, and a reconstructed pdf here (pictures are not the same). Read the whole thing if ballistic witchcraft is your thing. It's fascinating stuff. Shot 1 was a called flyer that I knew I pulled, so I took it out of the mix. Shots 2-5 were the remainder of that string, single-loaded with no particular attention to barrel cooling. Shots 6 & 7 were taken later, finishing up the box of ammo after another shooter had put several rounds through on a separate target. I put this through OnTarget. Combined, it's a 0.92MOA group. Six shots. 100yd. Factory rifle. Factory ammo. If I decide to get crazy about chasing groups, glass- and pillar-bedding with tuned handloads could get interesting. I started wondering what this would cost if I was paying cash out of pocket for the whole kit, instead of horsetrading wherever possible. Rifle: Savage 12 BVSS .308, from Bud's: $850. It would be entirely possible to go lower-budget on the base and rings and knock another hundred off ... but for a precision rifle, why would you? This particular setup may not be worthy of a Schmidt-Bender or Nightforce optic, but it is entirely capable of effectively reaching 750+ yards. It's worth spending the money to do that properly. This rifle has been on my "need to get it" list for a while. Not THIS exact rifle, but a rifle fitting the right niche. I've got .22s. I've got .223/5.56 autoloaders. I've got a 300BLK autoloader. I've got a .270Win bolt gun. What I didn't have was a ≥.30cal precision bolt gun. My .270, while perfectly serviceable, is a Remington 710 I bought very early in my hunting days. With 130gr handloads, a good bench, and proper planetary alignment it'll shoot 2MOA*. The scope is ... well, "budget" is probably generous. I think I spent $300 on the rifle with scope in a package deal. I don't want to knock the rifle too much - it's killed a few deer at ranges that made me look good (the best being a kneeling 260yd shot) - but it's no great shakes. My pusher has been trying to sell me a Savage .338LapMag (Model 110BA, if you're curious) he has on the counter. It's a beautiful rifle with a monster scope on top, and I'd love to have it. I am NOT, however, willing to shoot it to the tune of $5/bang. Nor do I have access to a range that will really let me use the reach of a .338. No, I wanted a .308 bolt-action. I've been perpetually trolling the classifieds looking for something that suited my fancy, and found a "want to trade" that caught my eye. I tossed a trade offer at the guy, we haggled back and forth a bit, and reached an agreement. - a keg of IMR 4895 powder: IMR 4895 is a classic and well-known powder for both .308 and .223 loading, and a full keg will guarantee consistency as well as provide enough for loading about 800 rounds of both those calibers. - a set of Lee .308 reloading dies (used), plus a length gage: I have used Lee dies consistently since I started reloading, and have had no issues whatsoever with them. I think I have a set of RCBS .223 dies in the drawer that I have yet to use - but that will change in the near future. - a Nightforce 20MOA tapered base: I hope to reach out and touch things with this rifle. 500+ yards, even a thousand if I can find the right range. With a 200yd zero, there's a 50" drop at 500yd, or 10MOA. Going out to 1000yd results in drop in the 40MOA range. That would pretty much max the internals of the scope I chose - so tilting it down 20MOA to begin with gives me a lot more wiggle room at longer distance. Nightforce because they're known for top-notch quality and aren't significantly more spendy than other reputable brands. - a set of Warne Maxima rings: These are bare-bones simple split rings. Four screws hold them together. No little slidey bits to clamp on a rail; they just clamp down evenly from both sides. Medium height seems to have been a good choice. With a shorter rail I might have been able to use low rings. As it sits I will need to invest in a cheek riser of some kind. - a Bushnell Elite 3200 10x40 mil-mil scope: I've never owned a mil-dot scope before. For known-distance targets they're not needed, but using a mil-dot for ranging is on the "I should know this" list. (Height in yards times 1000, divided by height in mils equals range in yards.) This particular scope because it is relatively inexpensive yet enjoys a great reputation as a fixed-power budget scope. It seemed a good way to try out mil-dot. If I like it, I will start saving pennies for a premium variable power first-plane mil-dot scope. - a Sightmark laser boresight: Because I hate boresighting by wiggling back and forth between the bore and the scope, and when you're zeroing with match ammo at a dollar a shot, it's worth spending a bit for a tool that can be used again (and in other calibers). Everything has arrived. The scope is mounted and mechanically zeroed. It's advertised as having 23.5mil (80MOA) of windage and elevation adjustment; I got 19.5mil (66MOA) of elevation and 22.2mil (75MOA) of windage. I am not thrilled with missing 20% of the elevation travel, but if I can zero it at 100yd with enough travel to come-up to a thousand I'll call it good. If not, I'll ship it back to Bushnell to correct or replace. But wait - the rifle! It's a Savage Model 12 BVSS, which means a laminate stock and heavy stainless barrel - and in this case, fluted. I ran a dollar under the barrel to check float - and it's free and clear all the way to the recoil lug. It's a heavy rifle; tipping the scale at ten pounds without sights or accessories. I'll be adding a short segment of Picatinny rail to the forearm for a quick-detach bi-pod, and looking for the aforementioned cheek riser. I'm an unabashed fan of Savage rifles. Their budget rifles have a great (and deserved) reputation for accuracy and the Accutrigger is amazing. I won't make any bones about it: they don't have the fit and finish of some of the big names... but DAMN they can shoot. This is my third Savage rifle and I expect there will be more in the future. My ONE gripe is a personal preference: the muzzle is not chamfered. There's a recessed target crown, but it's a sharp edge at the bore. I'd prefer to see a 45-degree chamfer there, for no good reason other than, "I like it that way." Now ... why .308? Why not .270, since I have all the equipment to reload for that? There are certainly those who will tell you that .270 is a better cartridge, flatter-shooting, more power at range... and they're sort of right. 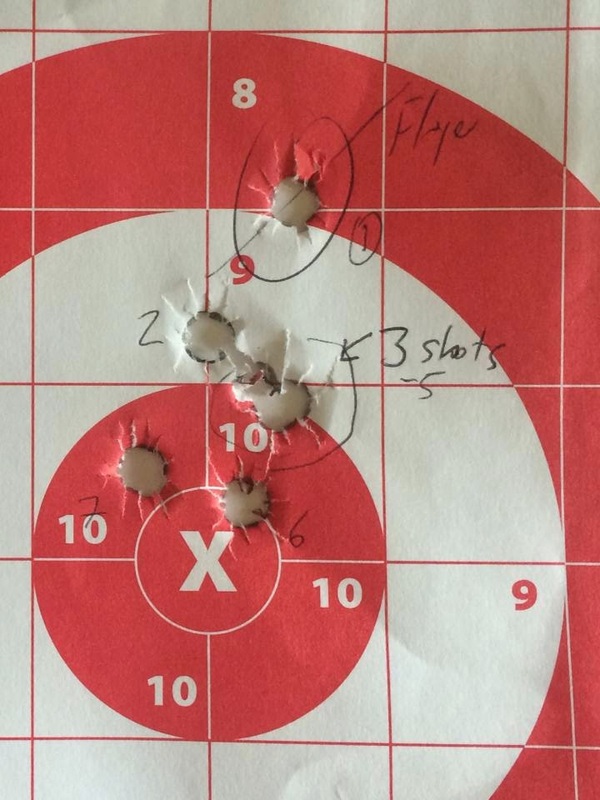 .270 is flatter-shooting. If you're hunting with a 'plex scope zeroed at 200yd, the maximum point-blank for deer-size game on that rifle is about twenty yards further. At 500yd, the .270 is hitting about six inches higher than the .308. On the flip side, it's shed more than half its muzzle energy - and at 500yd, six inches is 1.2MOA, or about five clicks on the scope. Ballistic coefficient matters when you start talking about long-distance shooting. Beyond that, .308 has a reputation for being a very tune-able cartridge and components are (usually) readily available. .270 is relatively limited in bullet selection: I just eyeballed Midway and they list 86 different .277" bullets... and 258 different .308". On to the range report. This was done on an outdoor range with sidewalls and sky baffles, so minimal wind effect (and it was mild and straight downrange anyways). Temperature was 70F. I scrubbed, oiled, and dry-patched the bore at home. Four shots of ZQI .308 were fired to foul the bore and go from boresight to rough zero. A front bag only was used for all shots. Here's the first four shots of ZQI. I laser-boresighted at 25yd and then single-loaded the first shot. It hit at 10 o'clock on the very outside ring. A second shot to confirm was on the same line but the inside of the 7-ring. I made a few sight adjustment and ended up on the outside of the 9-ring at 3:00. A few more clicks and it drilled the x-ring. I am not displeased by this in the least. Through OnTarget that comes out to 1.45MOA, and I know I can settle it down some with a bit of effort and a better front bag. Also, this is factory ammo, "match grade" though it may be, and once I start neck-sizing and tuning loads I can probably drop another half-minute. I fully expect to see 0.5MOA groups from this rifle in the future. And the scope... I am now in love with mil-dot reticles. Even without ranging, I love being able to very easily count mils I'm off from zero and dial in that correction at any range. No need to convert to MOA based on range, then count clicks ... just "I'm two mils high; twenty clicks down; done." Brilliant. Last but not least, whenever I start thinking about these multi-hundred-yard shots, I remember this article: "100 Yards is a Long Way". S'truth.